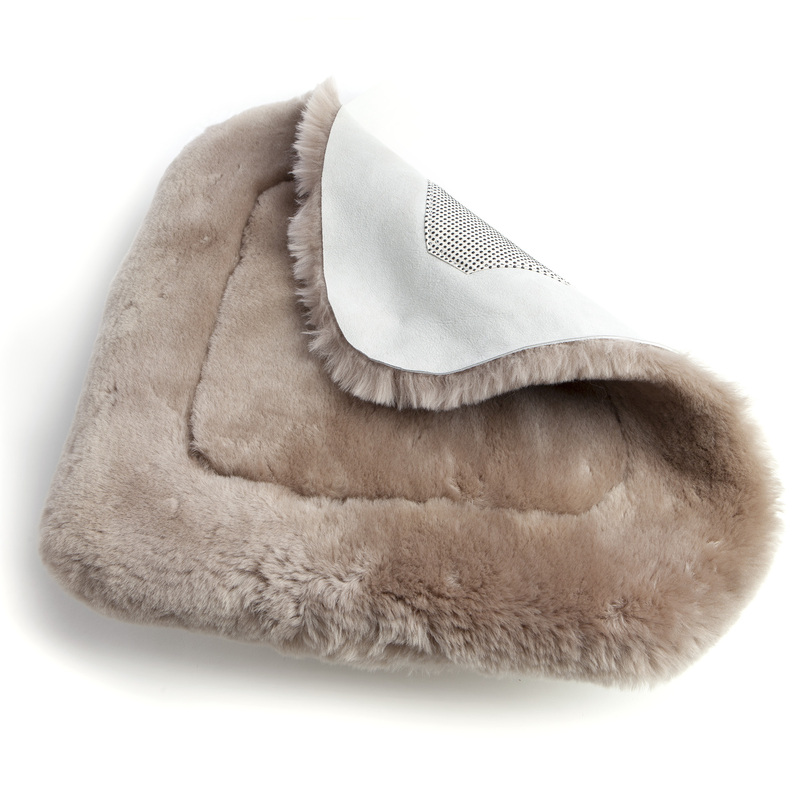 The elegance of a premium sheepskin seat pad is something that can be enjoyed in both warm weather and cold. Sheepskin is naturally breathable since the wool fibers are hollow. This special characteristic unique to sheepskin helps maintain a normal body temperature. This engineering feat of nature cannot be duplicated synthetically. And sheepskin never gets too hot or too cold! 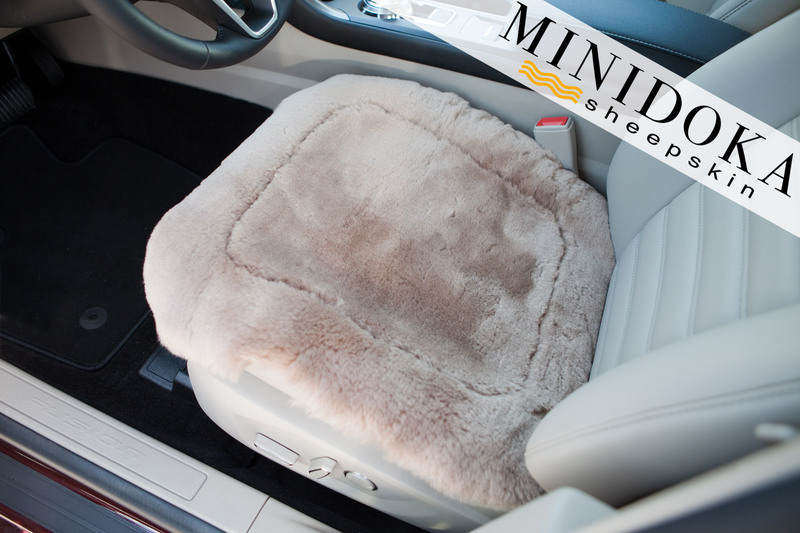 Getting into your vehicle with a Minidoak Sheepskin Seat Pad is a pleasant and natural delight - never again an unpleasantly cold or burning hot experience. 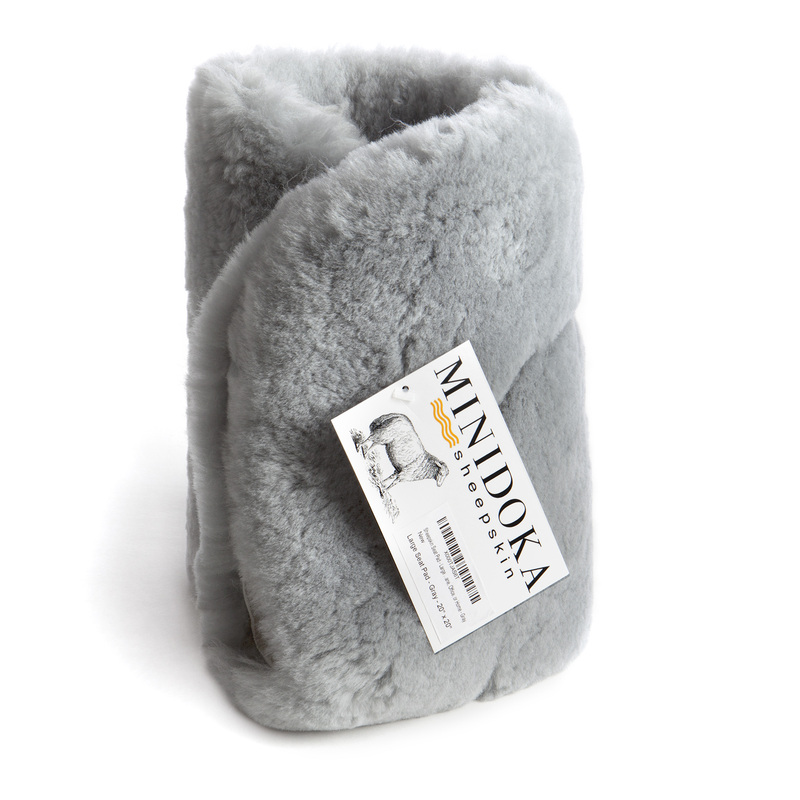 Minidoka Sheepskin seat pads are made from shearling, which is premium sheepskin with the wool shorn (trimmed). Shearling is desirable for seat pads because the shorn wool provides a springy cushion of support which provides maximum comfort while sitting for long periods. This cushion of natural wool reduces friction and pressure points, thereby promoting circulation and soothing comfort. • Premium Australian sheepskin. The soft natural leather on the back hugs the seat and looks as good as it feels. Protects seats from wear and tear. Hand crafted from the very best in materials and workmanship. • Sit in luxury! The soft wool is shorn (trimmed) to approximately 1 inch in length and provides a natural cushion which promotes circulation and reduces pressure points and discomfort while sitting for extended periods of time. The short wool is easy to maintain as it resists matting. • Special non-slip backing has PVC dots that prevent sliding when weight is applied, so the pad is easily transported for other uses. NOTE: Not recommended for use on heated seats. • Easy care! Machine washable with sheepskin soap. Stretch to shape while still damp, then air dry away from heat. Can also be dry cleaned. • Excellent for travel, office, stadium seating, wheel chair, your favorite chair at home, or anywhere you choose to sit in ultimate comfort! When we set out to create the perfect seat pad, we tried a multitude of designs and non-slip materials. It not only had to be comfortable and functional, it had to fit beautifully on all seats. We didn't want to use production plates (when many small pieces of scrap sheepskin have been patched together to form one piece), as this would require the entire back of the pad to be covered to prevent the patchwork from unraveling. That extra bulkiness would prevent the sheepskin edges from conforming to most seats. This method is standard practice, but we wanted to make something better. The best overall fit, look, and comfort was when the natural, soft pliable leather of the sheepskin rested directly on the seat. Adding the non-slip material to only the middle section was the hands down winner amongst our team of testers, some of whom spend an extreme amount of time driving, or working in office settings. Even though this required the use of a solid piece of sheepskin - which is a premium material compared to production plates - we knew this unique feature would be appreciated by the discerning buyer. Here at Desert Breeze Distributing, we can't get enough of the benefits of sheepskin. We found the seat pads were becoming popular for use as a desk pad! There's nothing quite like working at a desk with the soothing touch of nature right under your fingertips. Now we are all just as spoiled with comfort at our desk space as we are in our vehicles! 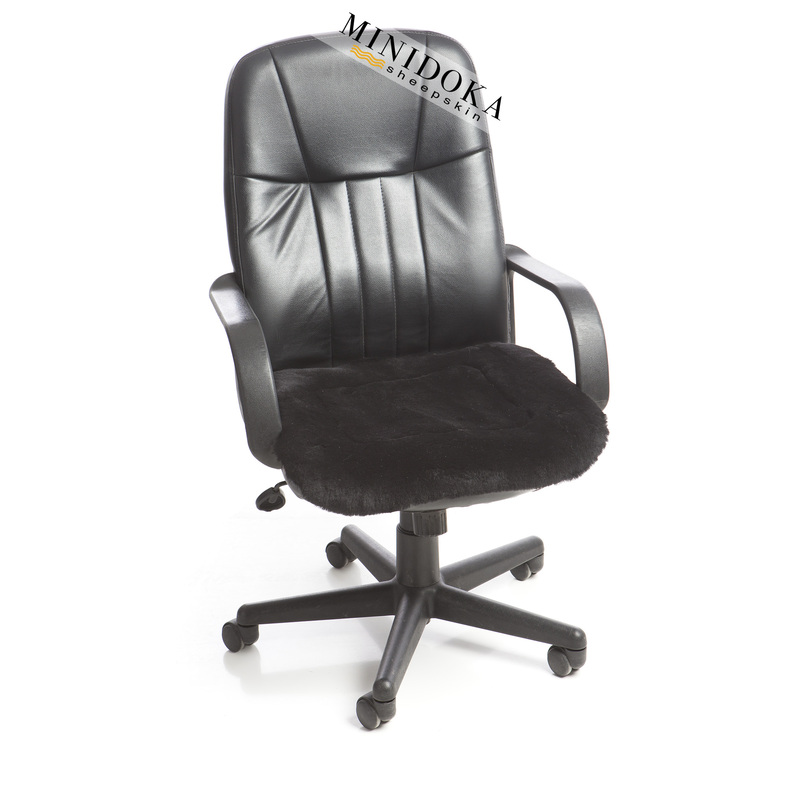 We have also heard from some of our customers that they are using Minidoka Sheepskin Seat Pads on metal folding chairs for greater comfort while in meetings, passengers enjoying the stress relief and increased circulation while on long flights, peace officers spending long shifts in a patrol car, and event goers using them on hard bleachers and stadium seating in hot and cold weather. The ability to easily move the pad for use in a variety of ways and have it perform excellent in each situation is why the Minidoka Sheepskin Seat Pad has become the best loved seat pad available. A luxury at work and at home. I bought this sheepskin seat pad to soften the woven rush seat of a mid-century modern chair in our living room. It works beautifully! It's pliable, so follows the curves of the chair, stays put, feels great, and, most importantly, makes the chair much more comfortable. It does everything just like they promised. So glad to have found it. Purchased 2 for my 2017 Chevy Trax! So far I love the them. Great quality! Can't wait to put them to the test this summer.....road trip! Thought they were a little pricey but if they hold up well and serve the purpose I purchased them for , they will be worth the price and will be a return customer! 115 Degrees, closed car and leather seats hurt on bare legs and we wear shorts and swim trunks. These seat covers are as essential as window shade covers. Well made. It pays to buy quality once. Best money I ever spent. My leather seats get so hot in southern Cali. But my sheepskin seat pad keeps me cool as a cucumber. I wish I'd bought this sooner. my back side stays cool and dry. Arrived as advertised ... high quality sheepskin leather with backer ... covers the entire seat in my Acura RSX Type S ... doesn't slip ... very comfortable ... I don't slip either, now. Fits on my office chair perfectly and doesn't move around and makes it much more comfortable to sit on. Not just for car seats! We bought this to keep my dad from slipping down in his leather recliner. It is a quality product and is working perfectly! Very comfortable in car. Makes big difference, especially on longer trips. Highly recommend. Perfect! Super soft and fluffy. Not disappointed. No problems with moving from my car seat. I have an E350 and fits perfectly. What else is there to say, these are very high quality look great and yes they stay in place!! BTW your website was much easier than the competitor. Love my new no slip sheep skin seat pads.